The post How to Prevent Dog Bites During the Stressful Holiday Season by Jill Breitner appeared first on Dogster. Copying over entire articles infringes on copyright laws. You may not be aware of it, but all of these articles were assigned, contracted and paid for, so they aren’t considered public domain. However, we appreciate that you like the article and would love it if you continued sharing just the first paragraph of an article, then linking out to the rest of the piece on Dogster.com. Holidays are fun yet filled with stress, especially for your dog. Their whole world turns upside down, thanks to there being more people around, including kids they may not know well. 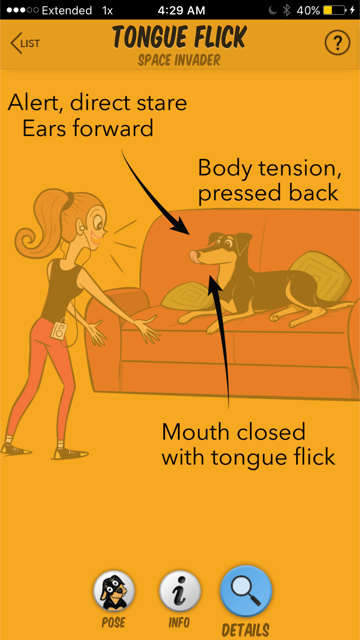 All of this can make your dog feel uncomfortable — and can create a situation where they may bite if you do not correctly read their body language. Here are some of the less-common ways dogs tell us they are stressed, so you can recognize anxiety and prevent dogs bites before they happen. Get the Dog Decoder app for additional help. It’s available in iTunes and Google play. 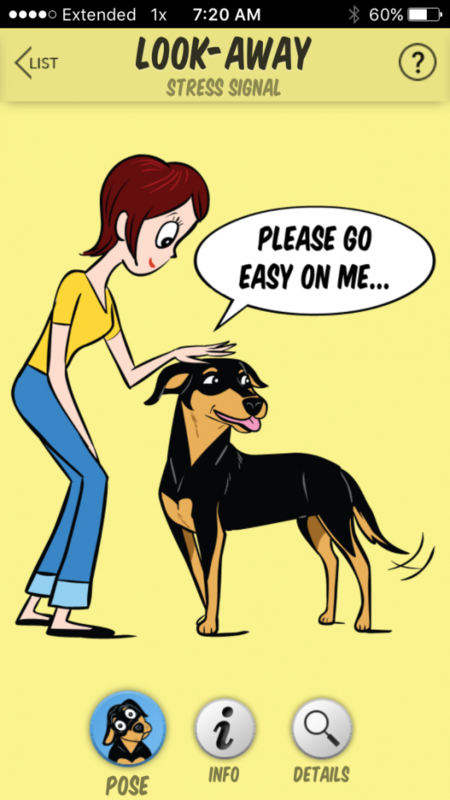 This is one of the first signs a dogs gives, and it is often ignored because many people don’t read it as anxiety. 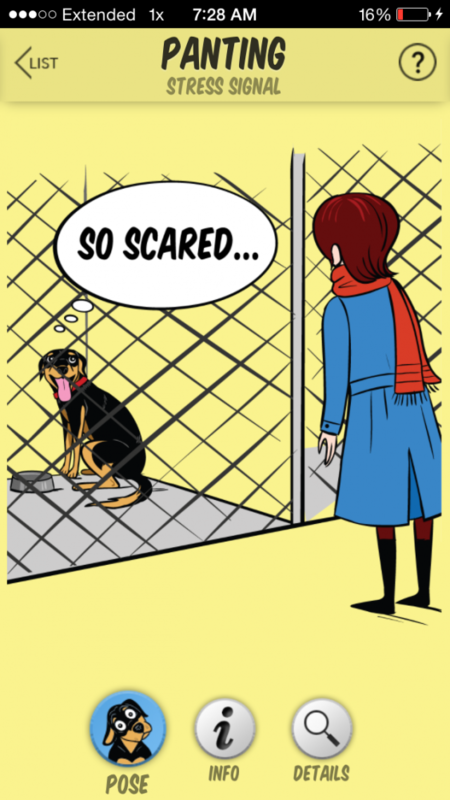 If you do see it, remove your dog from the situation and help them feel safe. Remember: A dog never bites out of the blue. There are many ways they show stress before it happens. Diamond, star of the Dog Decoder App, looks away from the person petting him. Image by Dog Decoder smartphone app/Illustration by Lili Chin. When it’s not warm and your dog is panting, it means they are experiencing a high level of stress and need to be removed from whatever is causing the anxiety. 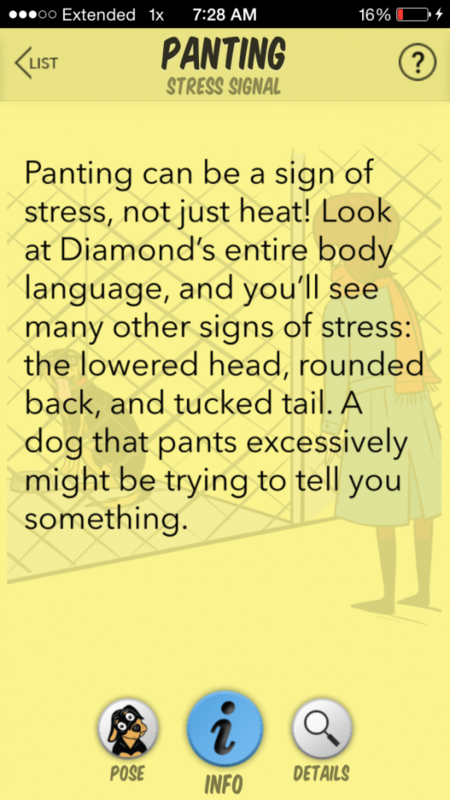 Diamond isn’t hot; he’s stressed. Image by Dog Decoder smartphone app/Illustration by Lili Chin. Be sure to look beyond the panting for other signs of stress. Image by Dog Decoder smartphone app/Illustration by Lili Chin. A tongue flick happens so fast it often goes unnoticed, yet it is again one of the first signs of stress that dogs use to tell you they are feeling anxious. Watch carefully for the tongue flick. 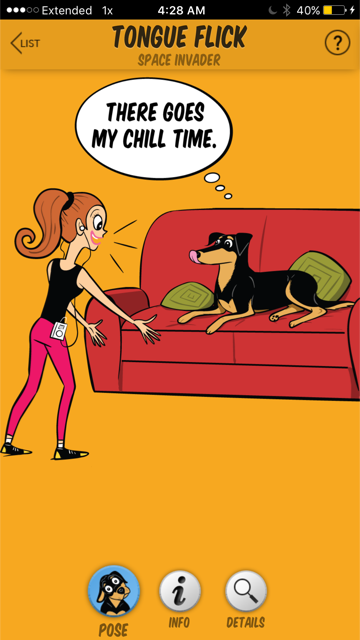 Image by Dog Decoder smartphone app/Illustration by Lili Chin. Other signs of stress may accompany it. Image by Dog Decoder smartphone app/Illustration by Lili Chin. 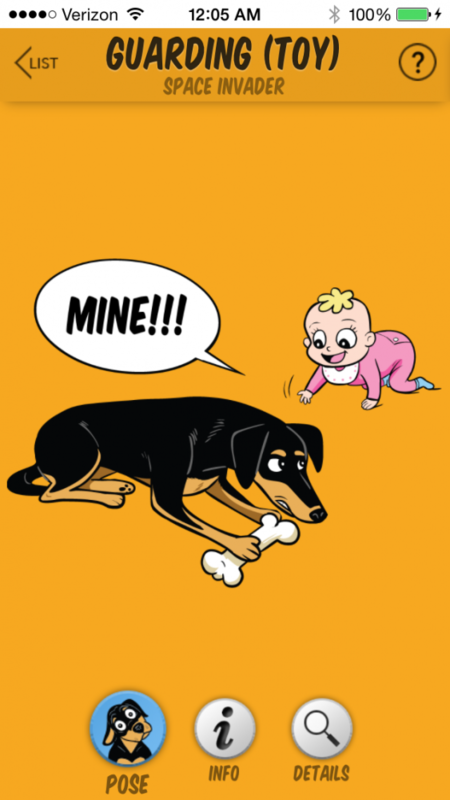 Pick up your dog’s toys, food, and other items if they aren’t used to having company, especially young visitors. Some dogs guard their belongings, and one of the first ways they do so is to become stiff and stop playing or chewing on the item. When you see your dog go still like this, remove them from the situation. When they are safely away, you can explain to your guests the signs that showed your dog was stressed. Kids actually love playing with the Dog Decoder app and see it as a game. You are your dog’s advocate, and this means keeping them safe while teaching others how to be safe around dogs as well. 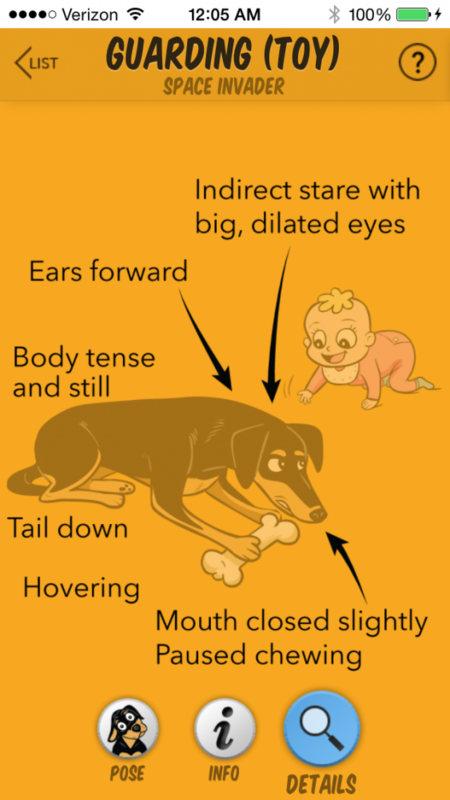 Dogs with bones do not mix well with crawling babies. Image by Dog Decoder smartphone app/Illustration by Lili Chin. Notice the other signs of stress as well. Image by Dog Decoder smartphone app/Illustration by Lili Chin. Learning signs of stress from your dog is one of the best ways to prevent dogs bites. Keep your dog on leash, in a crate, or in another room for greetings. Don’t let anyone, especially children, hug your dog. Most dogs don’t like it. Assign one adult to supervise your dog. Assign one adult to supervise toddlers and other small children. The day before or morning of a gathering, take your dog for a hike, have a play date, or throw the ball in addition to having a training session. Stimulate her mind and body before big events. If you notice signs of stress, remove your dog from the situation immediately. You can keep her with you on a leash, or put her in her crate or in another room with some quiet music. Your dog will be much happier and less stressed, and everyone will be much safer. Don’t be a statistic at the ER room this holiday season. Keep you, friends and family and your dog safe with these tips to prevent dogs bites. Thumbnail: Photography © Halfpoint | Thinkstock. About the author: Jill Breitner is a professional dog trainer and dog body language expert, loving and living life with friends and family. She a certified Fear Free Professional and the author of Dog Decoder, a smartphone app about dog body language. Join Jill on her Dog Decoder Facebook page.